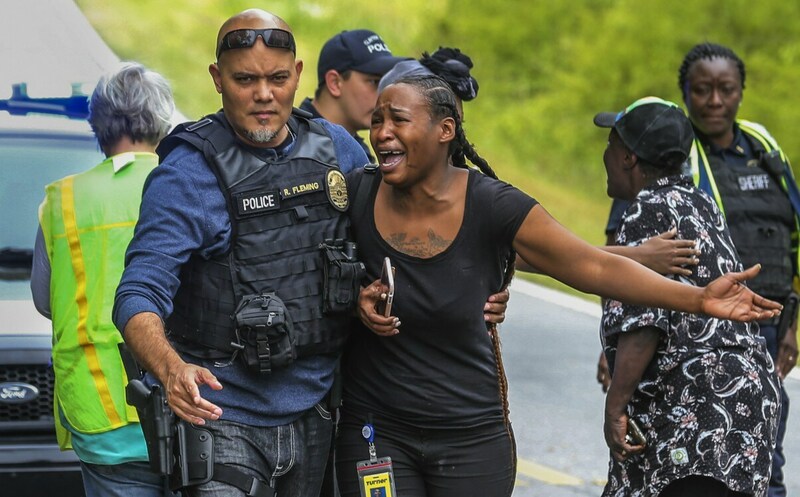 A woman believed to be related to ones involved in a hostage situation reacts as law enforcement on the scene tried to console them in Stockbridge, Ga., Thursday, April 4, 2019. ATLANTA (AP) — A standoff that began when two Georgia police officers were shot and wounded has ended with a 16-year-old boy and his pregnant mother both killed by a gunman who then killed himself, authorities said. “I got a hostage!” the gunman yells at one point, his voice captured in a body camera that was dropped inside the home. He warns officers not to come near him — and that he has plenty of ammunition. However, by late Thursday night, the gunman was refusing to surrender and would not “provide proof of the well-being” of the teenager and the woman inside. So commanders made the decision to deploy gas inside the home, police said. “The suspect fired numerous rounds at SWAT officers and vehicles,” police said in an update on social media late Thursday. “We was getting ready to give her a baby shower tomorrow,” Sandra White’s mother, Kathie White, told The Atlanta Journal-Constitution on Friday. Anetria White broke down in tears as she described seeing blood and then enduring hours of anguish and worry, “and then you find out that all three of them were gone,” she said. In December, Henry County Officer Michael Smith was shot at a dentist’s office and died of his wounds about three weeks later. Employees at the dentist’s office had called police about a man who had been acting erratically and Smith was shot as he confronted the man. In February 2018, Locust Grove Officer Chase Maddox, 26, was shot in the head and killed in the Henry County town he patrolled. Two Henry County sheriff’s deputies were also wounded in that shooting as the three law enforcement officers tried to serve an arrest warrant at a home.